We offer a wide range of nail treatments here at Miracles Hair and Beauty Lounge. We only use the best products on the market for our nail treatments as we believe quality is paramount to performing the perfect treatment. Treat yourself to some Me Me Me time have a nail treatment which will leave you with gorgeous nails and be the envy at that must go to party or lie on the beach and watch the sun make those nails glisten!!!! If its a pamper you want choose the original manicure/pedicure. If its fabulous looking colour you want go for the ultimate and have Gel polish applied. If you need extensions to those bitten nails indulge yourself and have the acrylic/gel extensions. Gel Polish has transformed salon service manicures and pedicures delivering 14+ day flawless wear, superior colour and mirror shine with zero dry-time and no nail damage. The product is thin and strong enough to be applied similarly to nail polish, but it is cured in a way that gives it great flexibility and durability. It also has the incredible shine associated only with gel nails. Who is Gel Polish best suited for? 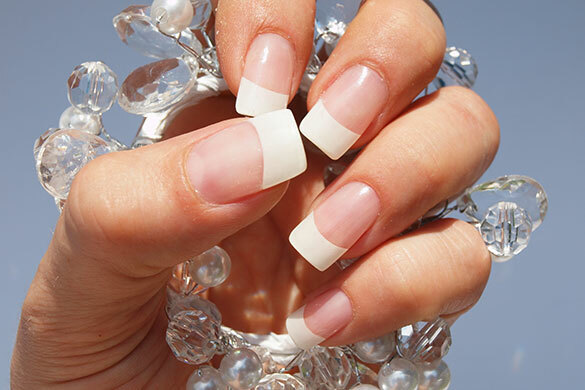 Those looking to lengthen their nails. You cannot use Shellac to create a longer nail. Also, Shellac isn’t for clients with extremely damaged nail beds, split or peeling nails. It is best to get on a corrective program with your manicurist before thinking about Shellac. If your nail is peeling off, it will take Shellac with it. How is Gel Polish different from the traditional polish manicure? Typical nail polish dries by evaporation, which means your manicure is not cured until 2-3 hours after your service. But Gel Polish is cured by UV light, and within minutes. Your nails are completely dry by the time your manicure is over, and strong enough to withstand accidental knocks. It acts like a plasticised coating, suitable as a long-lasting polish. How is a Gel Polish service different from traditional nail enhancements (fake nails)? Drills are never used or needed with Shellac, and removal does not leave nails dry, thin, possibly torn. Can you apply Gel Polish at home? No, Gel Polish can only be applied by a licensed, trained manicurist. Improper tools or techniques will give a less than desirable result with Gel Polish. Can you take Gel Polish off at home? You can. It requires the use of 100% acetone. Removal at home can be done; proper removal is only 15 minutes overall. However, removal at the salon very minimally increases the time and may be less of an inconvenience for you.